44034 PER2699.JPG 500X638\PER2699.JPG 44035 PER2699_1.jpg 500X638\PER2699_1.jpg Send A Hint! Product Description: less text Spoil that beer-loving pal or family member with this unique beer mug which is printed with a quirky 'prescription' design which is also personalised for that special touch. Cheers to that! 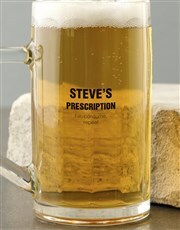 * 1 Glass only, props not included Get this Personalised Prescription Beer Mug delivered with NetFlorist.